Here are easy directions on how to make popcorn garland for yourself! Step 1: Make some popcorn. At least one large size bowl is needed, but that will depend on the size of your tree. Be sure to let the popcorn cool. Step 2: Thread the needle, but do not cut the thread from the spool because it will take a lot of thread for the popcorn garland to cover an entire tree. Step 3: Start stringing one popcorn at a time by inserting the tip of the needle into the center of each piece. For a more colorful garland, add cranberries to the string! Step 4: Keep sliding it further down on the thread making room for more popcorn. Step 5: Once you feel that you have enough garland for the size of your tree tie off the end of the thread by looping the thread. Make sure that it is well-secured, and then gently cut the thread. Step 6: Carefully hang the garland onto your Christmas tree. -Letting the popcorn sit out for a while to get stale will make it easier to string, because it won't be as crisp and likely to break when you stick the needle in it. -Plain, unbuttered and unsalted, popcorn is less likely to attract bugs. -Waxed dental floss is stronger than thread. -Do not let popcorn burn and do not use burned popcorn. -Seasoned or flavored popcorn is likely to attract bugs. I fear the children would eat more then what would make it on the thread. and yes Cathie, they do eat a lot.. but that's part of the fun. I would have to make like 5 bowls of popcorn cuz my kids would eat at least 3 of them and spill the rest! 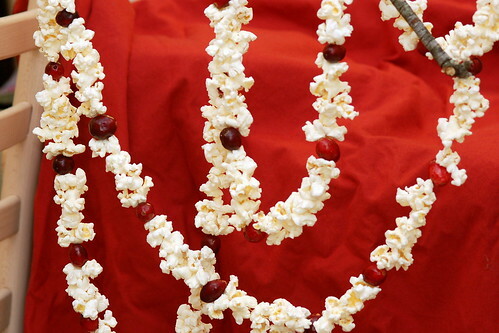 We make the popcorn garland too but I havent added cranberries in fear they would mold. Is this not the case? Do they simply dry out? As much as I love this family activity and the look it gives our tree, it takes FOREVER! Now days I bet somebody has invented a plastic needle or something that won't prick the kids' fingers. Nothing like when I was a kid and my mom's favorite response was, "tough."